So a very exciting thing happened to me last month. 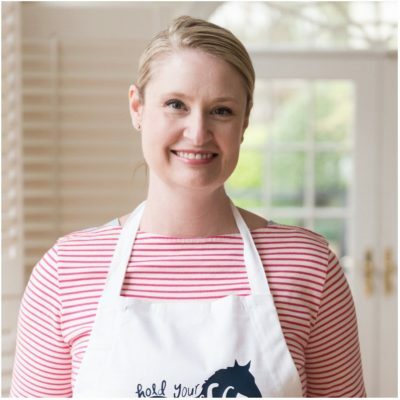 I was asked to be a Moda Bake Shop designer! 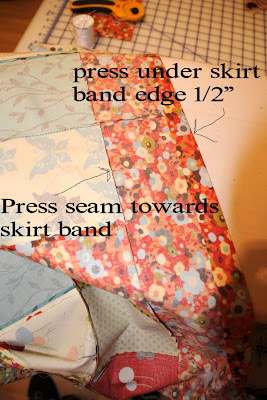 It’s this patchwork skirt tutorial. 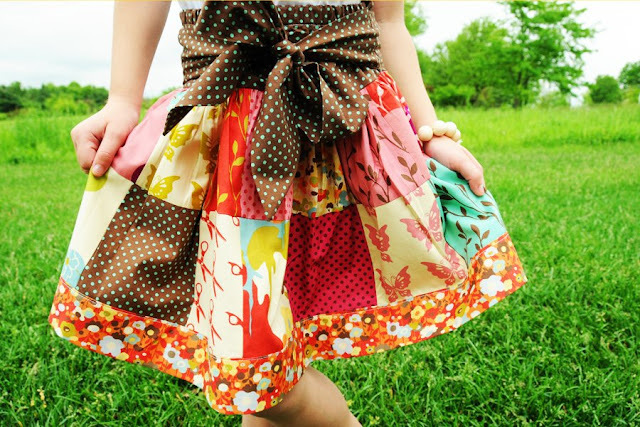 From your charm pack, lay out a pattern of squares that you would like for the skirt front. You will have 2 rows of 7 squares. 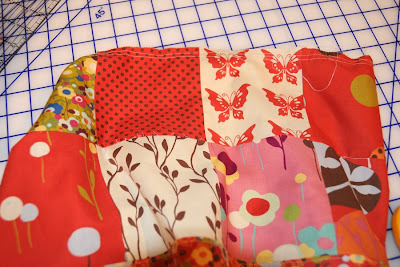 Sew the 1st row of 7 squares together using a 1/4″ stitch- it is very important to keep all your seams the same. My machine has a setting for a 1/4″ stitch. Press seams open on row 1. Pin and sew row 1 to row 2. You will end up with 2 panels, 2 squares by 7. 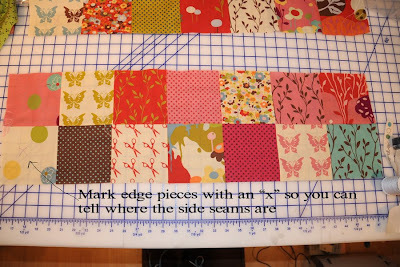 Mark, with a fabric marker, the 2 edge squares. 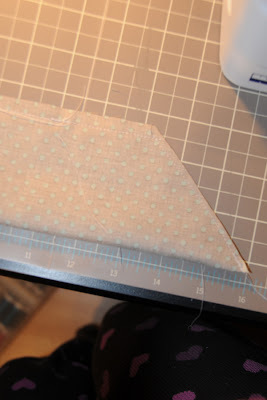 This is so you will know where your side seams are (this will beimportant when attaching the skirt to the waist band) Do NOT sew side seams yet. With right sides together, attach skirt band to bottom of skirt. 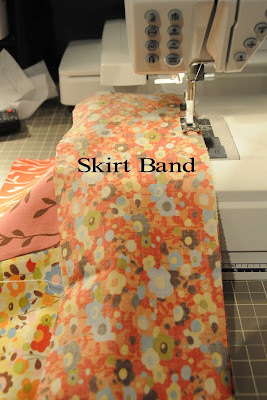 (skirt band will overlap skirt at this point) Sew with 1/4″ seam. Press seams towards skirt band. Turn under bottom edge of skirt band 1/2″ and press. 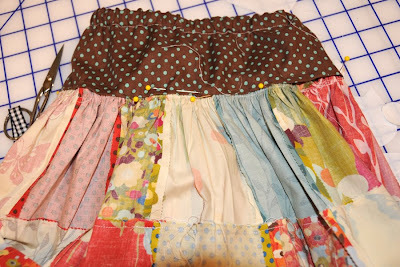 Fold skirt band in half so that the pressed edge covers the seam of the skirt/skirt band. PIN in place from the RIGHT side of the skirt. 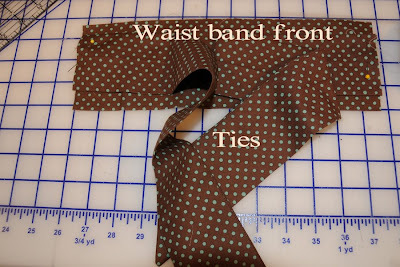 Fold tie pieces in half length wise. 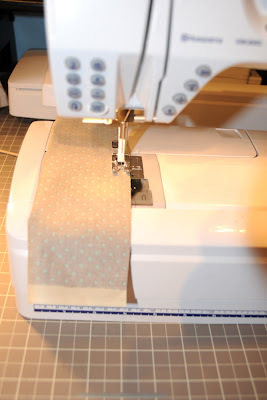 Sew with 1/4″ seam. At the end sew and angle, so that the tie comes to a point. 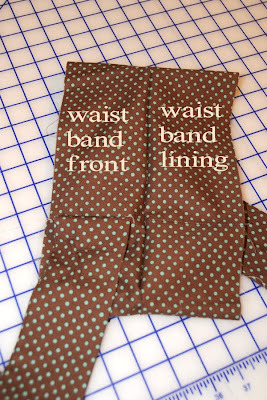 Take waist band FRONT piece. Pin ties to it, 3/4″ down from the top. Baste in place. Attach waist band BACK to front, sew at side seams. Press open seams. Sew waist band lining pieces together at side seams. Press open seams. 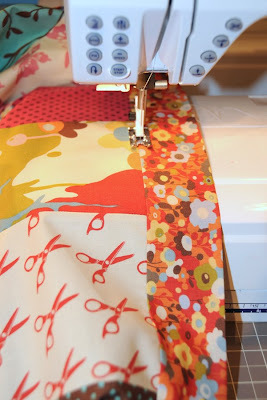 Sew waistband to waistband lining at TOP seam. Press open. 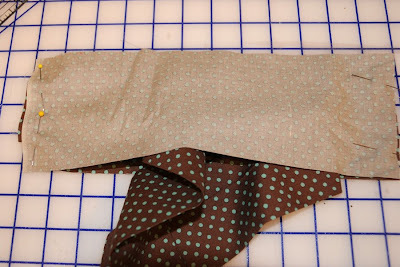 Fold waist band at top seam. Press well. 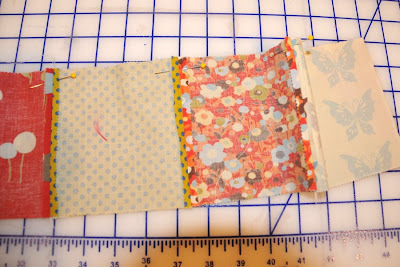 Come down 5/8″ from the top and sew a casing. Leaving a 1″ opening for the elastic. Pin RIGHT side of skirt to RIGHT side of skirt band, matching side seams. Sew, being careful not to catch ties in the seams. 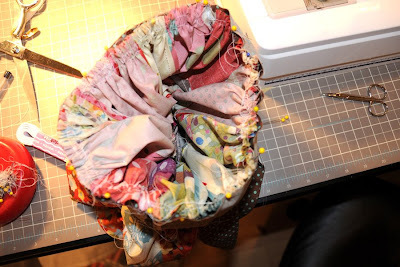 Turn skirt inside out. Measure elastic to size and thread though casing. 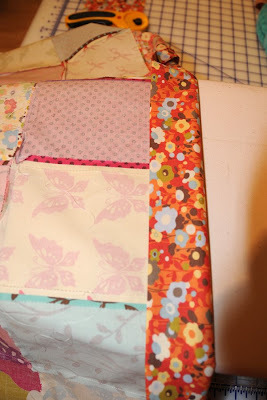 sew elastic together and close casing. 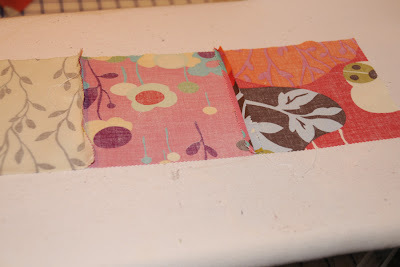 Press under unfinished edge of waistband lining 1/2″. 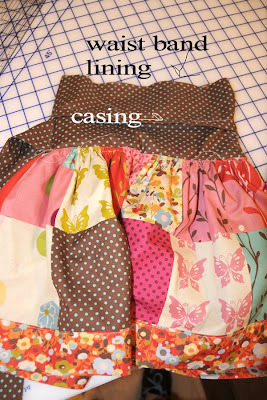 Pin to skirt (covering gathers). Whip stitch closed. 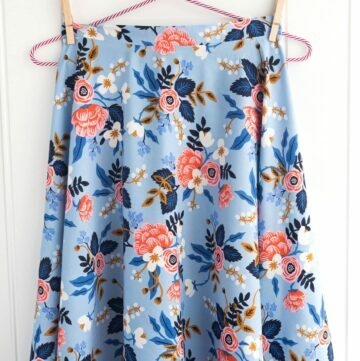 My daughters waist is 20″, normally for gathers you double the waist, but I did not want this skirt as full so I took 20″ x 1.75 = 35″, which is 7 charm squares. Since she is small I thought 2 rows of squares would look best. If you are making a larger size, add a 3rd row of squares. For the waistband measurement I took her hip measurement. 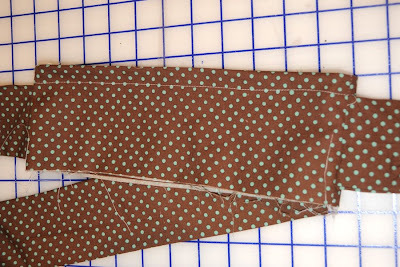 For the ties I wanted to conserve fabric, so I cut the 1/2 the width of my fabric. They BARELY fit, I would make them longer if you have enough fabric. I’ve can’t wait to brag about you some more- Congratulations! 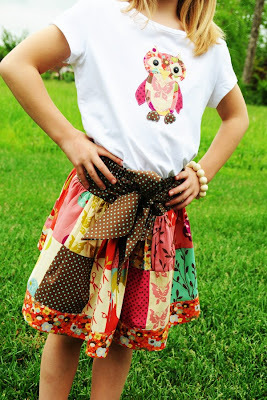 I love the skirt and the owl- dArLiNg! Just found you via Moda Bake shop, and not only are you super creative, but in l’ville. My husband is from Louisville, and we lived there from 2003 to 2006. I miss so many things, and one is the amazing creative people that live there. I’ll be checking in often! I too found you from the bake shop. 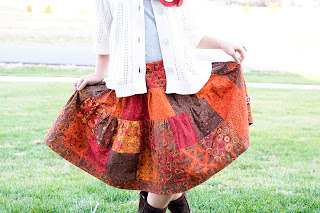 Love your blog, and what a great skirt tutorial! Couldn’t have happened to a better person! I’m so excited for you and lucky to know you away from blog land too! This one is has the best colors. I love it. 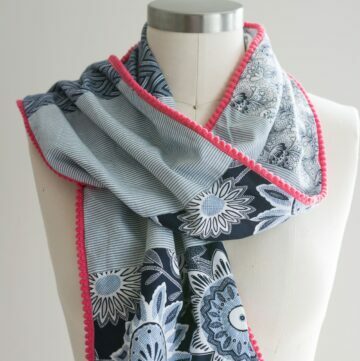 The owl applique goes with it perfectly. Thanks for including me in this one! Congratulations!!!! That is so exciting! Can’t wait to try the skirt!! Congratulations! 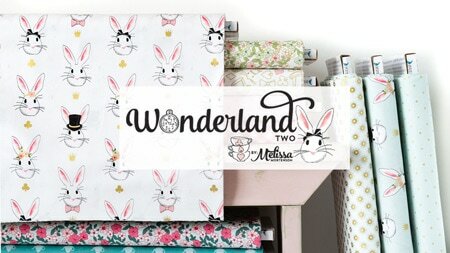 I have spent waayy too long going through your blog, but i can’t help it, it is FABULOUS!!! You are simply awesome! You go girl!!!!!! Love! Love! Love! The skirt is so amazing. 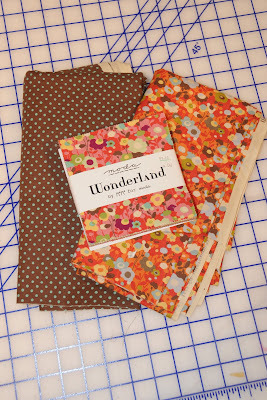 Have a few questions, if you don’t use the 1-2 Wonderland Charm Packs, how much fabric do you need, and how big are the squares? Found you from the Bake Shop, your blog is so cute! 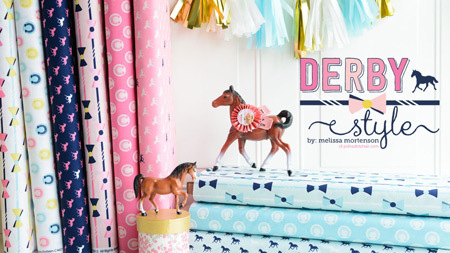 It makes me want a little girl even more than I already did! Another amazing skirt!? 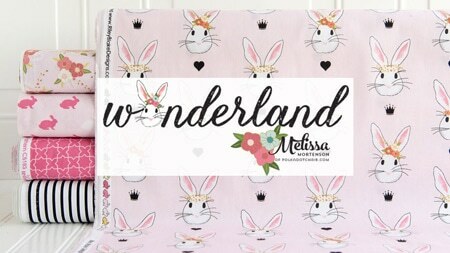 You are fantstic, you do the best tutorials, I am soooo excited to make this for my daughters! I am so excited about this skirt (don’t let the phase end!) 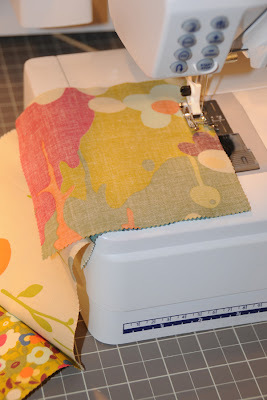 that I’m going to squeeze in a trip to the quilt shop before I go to a meeting! Saw the skirt at church and about DIED at how cute it is. WIshing I could hire you…. What a beautiful skirt and congrats!! I’ll be checking in often for more beautiful skirts! I just made it this afternoon for my niece! Great directions and FABULOUS concept. That sash is fantastic! 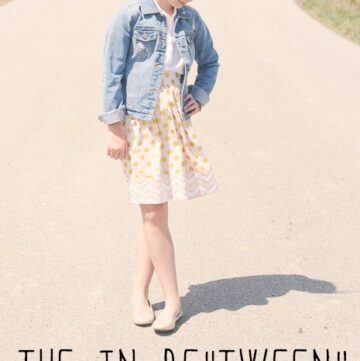 Oh, and I agree with the girls above, I’d LOVE to have this in my size, but I need you step by step directions! Any chance? 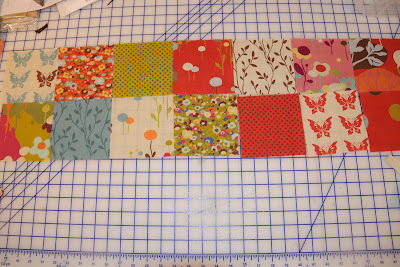 I was looking at this pattern and wondering- you say you did 20″ x 1.75 for the gather which is 7 charm squares, but then you use 14 squares because you have 7 in the front and 7 in the back- is this correct? That would then be a total of about 70 inches around instead of the 35 inches. Can you help me understand this? Do you think this would work with Corduroy? Also, if I didn’t have a charm pack and need to cut my own squares, what size should they be? technically it would work with corduroy… but corduroy frays ALOT so I would only do it if you sewed all the seams with a serger.. otherwise you’ll have a big mess. The charm squares are 5″ each! Okay, I’ve look ALL over, and can’t see WHERE to purchase “Charm Packs.” I’m sure I’m just overlooking it….but I wanna try one of these!! I am new to sewing and this was my first project — it turned out great!! Thank you so much for sharing! 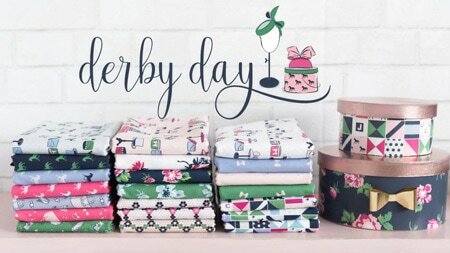 I love your stuff and I am so excited to try to sew some skirts. 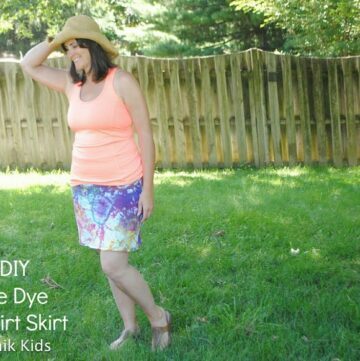 I have 3 daughters and i LOVE to have them match and with sizes so different this will solve my problems.. hello spring and new skirts!!! Thanks for sharing. I’m so glad that it was helpful for you! !